The deep pocket of the lady slipper orchid traps a bee for a short time, so it pollinates the flower. 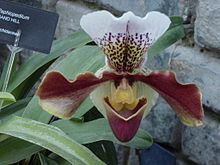 Lady's slipper orchids are the orchids in the subfamily Cypripedioideae. They are special because of their slipper-shaped pouches on their flowers. The pouch traps insects so that they must climb up past the modified stamens, where they get or give pollen, fertilizing the flower. Some people think this subfamily should be different from the Orchidaceae as a family Cypripediaceae. A lady slipper orchid has a deep pocket that is actually a bee trap. When a bee crawls down into the flower to get the nectar, the pocket on the flower closes shut. Because of this, the bee is stuck for a while, wiggling and squirming, getting pollen all over itself. The bee finally finds a small opening near the top of the orchid, and it gets out so that it can get trapped inside another lady slipper, where it will give that pollen to the other lady slipper's stigma. The lady's slipper is also known in the United States of America as the moccasin flower, because it looks like a shoe or moccasin. ↑ Rasmussen F.N. 1985. "Orchids". In R.M. Dahlgren et al eds. The families of the monocotyledons. Springer Verlag, Berlin. ↑ Cash C. 1991. The Slipper Orchids. Timber Press. ISBN 0-88192-183-1.